Part 3: Who Were the Key Players Responsible for Facebook’s Support to Modi and the BJP? In this, the third report in the series, we outline the role played by key individuals with close links with the BJP and Prime Minister Modi in propagating his party’s right-wing Hindu nationalist agenda on social media platforms like Facebook. Is Facebook truly a neutral and an agnostic platform for all to use? Far from it. After interviewing nearly 50 people over the last five months, we have put together evidence (some of it circumstantial) to indicate that senior employees of Facebook in India have worked, and continue to work, very closely with the country’s ruling regime. Given past experience, the question is how neutral Facebook will be in the run-up to the April-May 2019 general elections. In the first article in this series of reports, we examined allegations relating to the complicity of Facebook and WhatsApp in disseminating disinformation, hate speech and incendiary information. In the second, we reported on how Facebook arrived at the dominant position it is in India at present with more than a little help from friends of the Bharatiya Janata Party and Prime Minister Narendra Modi. In this, the third report in the series, we outline the role played by key individuals with close links to the BJP and with Modi in propagating his party’s right-wing Hindu nationalist agenda. A very important initiative that Mumbai-based technology entrepreneur Rajesh Jain spearheaded for Narendra Modi and the Bharatiya Janata Party in the run-up to the April-May 2014 general elections was the construction of an ambitious database of voters which could be used to target messages for users on the social media, specifically WhatsApp and Facebook. Huge volumes of data were scraped from public sources, including electoral rolls and polling booth forms of the Election Commission of India. The idea was to “geo-fence” areas and map vote-swings. By collating names and analysing voting patterns from publicly-available data, Jain’s team was able to help the BJP identify strong and weak constituencies across the country, all the way down to the level of the voting booth. Also Read: Part 1: Is Facebook in India Truly Independent of Political Influence? Not Really -- It Has Backed Modi and BJP. By the time Jain was scaling up his operations, the BJP’s IT strategists had begun interacting with social media platforms like Facebook and its partner WhatsApp. If supporters of the BJP are to be believed, the party was better than others in utilising the micro-targetting potential of the platforms. However, it is also true that Facebook’s employees in India conducted training workshops to help the members of the BJP’s IT cell. Helping party functionaries were advertising honchos like Sajan Raj Kurup, founder of Creativeland Asia and Prahlad Kakkar. Actor Anupam Kher became the public face of some of the advertising campaigns. Also assisting the social media and online teams to build a larger-than-life image for Modi before the 2014 elections was a team led by his right-hand man Dr Hiren Joshi, who (as already stated) is a very important adviser to Modi whose writ extends way beyond information technology and social media. Currently, officer on special duty in the Prime Minister’s Office, he is assisted by two young professional “techies,” Nirav Shah and Yash Rajiv Gandhi. Joshi has had, and continues to have, a close and long-standing association with Facebook’s senior employees in India. In 2013, one of his important collaborators was Akhilesh Mishra who later went on to serve as a director of the Indian government’s website, MyGov India –which is at present led by Arvind Gupta who was earlier head of the BJP’s IT cell. Mishra is CEO of Bluekraft Digital Foundation. The Modi pre-election campaign was inspired by the 2012 campaign to elect Barack Obama as the “world’s first Facebook President.” Some of the managers of the Modi campaign like Jain were apparently inspired by Sasha Issenberg’s book on the topic, The Victory Lab: The Secret Science of Winning Campaigns. In the first data-led election in India in 2014, information was collected from every possible source to not just micro-target users but also fine-tune messages praising and “mythologizing” Modi as the Great Leader who would usher in acche din (good times) for the country. Four teams spearheaded the campaign. The first was led by Mumbai-based Jain who funded part of the communication campaign and oversaw voter data analysis. He was helped by Shashi Shekhar in running NITI and “Mission 272+.” As already mentioned, Shekhar had worked in Infosys and is at present the head of Prasar Bharati Corporation which runs Doordarshan and All India Radio. The second team was led by political strategist Prashant Kishor and his I-PAC or Indian Political Action Committee who supervised the three-dimensional projection programme for Modi besides programmes like Run for Unity, Chai Pe Charcha (or Discussions Over Tea), Manthan (or Churning) and CAG or Citizens for Accountable Governance that roped in management graduates to garner support for Modi at large gatherings. Having worked across the political spectrum and opportunistically switched affiliation to those who backed (and paid) him, 41-year-old Kishor is currently second-in-command in Janata Dal (United) headed by Bihar Chief Minister Nitish Kumar. The fourth team was led by Arvind Gupta, the current CEO of MyGov, a social media platform run by the government of India, who ran the BJP’s campaign based out of New Delhi. When contacted, he declined to speak on the record saying he is now with the government and not a representative of the BJP. He suggested we contact Amit Malviya who is the present head of the BJP’s IT cell. He came on the line but declined to speak specifically on the BJP’s relationship with Facebook. From all accounts, Rajesh Jain worked independently from his Lower Parel office and invested his own funds to support Modi and towards executing what he described as “Project 275 for 2014” in a blog post that he wrote in June 2011, nearly three years before the elections actually took place. The BJP, of course, went on to win 282 seats in the 2014 Lok Sabha elections, ten above the half-way mark, with 31.4 per cent of the vote. As mentioned, when we contacted 51-year-old Jain, who heads the Mumbai-based Netcore group of companies, said to be India’s biggest digital media marketing corporate group, he declined to be interviewed. Incidentally, he had till October 2017 served on the boards of directors of two prominent public sector companies. One was National Thermal Power Corporation (NTPC) – Jain has no experience in the power sector, just as Sambit Patra, BJP spokesperson, who is an “independent” director on the board of the Oil and Natural Gas Corporation, has zero experience in the petroleum industry. Jain also served on the board of the Unique Identification Authority of India (UIDAI), which runs the Aadhar programme. Unlike Jain who was not at all forthcoming, 44-year-old Prodyut Bora, founder of the BJP’s IT cell in 2007 (barely a year after Facebook and Twitter had been launched) was far from reticent while speaking to us. He had resigned from the party’s national executive in February 2015 after questioning Modi and Amit Shah’s “highly individualised and centralised style of decision-making” that had led to the “subversion of democratic traditions” in the government and in the party. Bora recalled how he was one of the first graduates from the leading business school, the Indian Institute of Management, Ahmedabad, to join the BJP because of his great admiration for the then Prime Minister Atal Behari Vajpayee. It was at the behest of the then party president Rajnath Singh (who is now Union Home Minister) that he set up the party’s IT cell to enable its leaders to come closer to, and interact with, their supporters. The cell, he told us, was created not with a mandate to abuse people on social media platforms like WhatsApp and Facebook. He lamented that “madness” has now gripped the BJP and the desire to win elections at any cost has “destroyed the very ethos” of the party he was once a part of. Today, the Gurgaon-based Bora runs a firm making air purification equipment and is involved with an independent political party in his home state, Assam. Bora had left the IT cell and moved to Assam to work for the BJP by the time Nitin Gadkari replaced Rajnath Singh as the BJP president. A Mumbai-based IT specialist, who is close to Gadkari, then played an important role in helping the party organise its internet and social media strategies. He was Vinit Goenka (briefly quoted earlier). Like Bora, he was loquacious in telling us how the party used Facebook and WhatsApp to spread the BJP’s agenda and boost Modi’s image. Unlike Bora, however, Goenka remains firmly aligned with the party and particularly with his political mentor. He is a member of a task force on IT in the Ministry of Shipping and the Ministry of Road Transport and Highways, both headed by Gadkari. Goenka is also a member of the governing council of the Centre for Railway Information System (CRIS) in the Ministry of Railways headed by Piyush Goyal. Having been a member of the party’s youth wing since 2003, with Gadkari’s prodding, Goenka joined the BJP’s IT cell in Maharashtra in 2008 to help “modernise” the party. His first successful initiative was to supervise the setting up of high-definition video conferencing facilities in different districts of the state to enable leaders like Gadkari to interact regularly with the BJP’s karyakartas (or party personnel). He did not look back thereafter and rapidly expanded his operations across the country. By the time election campaigning started picking up in late-2013, he had put together a network of over 78,000 people who were fully engaged in aggressively promoting the interests of Modi and the BJP in rural blocks and urban wards in 29 states and seven Union territories. Significantly, in each group, one person was deputed to focus on the social media, Facebook, WhatsApp and Twitter. Goenka also played a key role in connecting BJP’s leaders with IT industry bigwigs, including Som Mittal and Rajendra Pawar and business associations like the Indo-US Business Council. He helped his party organise regular meetings with IT professionals and entrepreneurs. The meetings were called “Let’s Talk Governance” and held every Saturday at the BJP’s office at 11 Ashoka Road in central Delhi. By around this time, Shivnath Thukral had entered the picture to become an important player in the online campaign to promote Modi and the BJP. Thukral had left New Delhi Television (NDTV) in October 2009 as an anchor of television programmes on the corporate sector and stock-markets to join the Essar group (promoted by the Ruia family) as its group president, corporate branding and strategic initiatives. The Essar group had supported various events and festivals, including the “Think” festival hosted by Tehelka magazine in Goa. His wife Shaili Chopra (another television journalist and anchor) was later employed by the magazine. More about Chopra and her venture “SheThePeople” in the next article in this series. An aside: The Essar group, which has interests in oil, gas, steel and power, has had more than its share of controversies in recent times, some of them on account of the huge debt burden of particular group companies. The names of some of its promoters and their relatives cropped up in the scandal relating to allotment of second-generation (2G) telecommunications spectrum. In 2015, a whistle-blower leaked internal information about the group which, among other things, revealed that gifts of expensive mobile phones and other facilities – hospitality and transport – had been made available to important politicians, bureaucrats and journalists. There have been media reports, including in the Caravan, that the Essar group had provided jobs to persons recommended by politicians, including former President of India Pranab Mukherjee. Gadkari reportedly availed of hospitality from the Essar group in France. Thukral went on to join the Carnegie Foundation in India and thereafter, became director of policy for India and South Asia for Facebook in India as an important executive interfacing with government bureaucrats, technocrats and politicians together with Ankhi Das. In the run-up to the 2014 elections, from late-2013 onwards, Thukral, along with investment banker, Anuj Gupta, helped Hiren Joshi create and run Mera Bharosa (literally translated to mean “my trust”) and other web pages for the party. He has become an unofficial member of the BJP’s social media team. 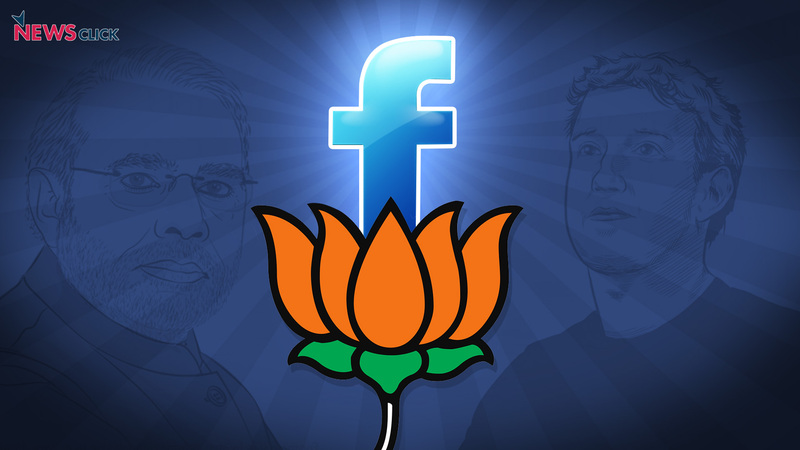 Also Read: Part 2: Did Facebook in India Help BJP and Modi? Or Was it Vice Versa? It was difficult for us to access the pages that Mera Bharosa had put out before the 2014 elections. We were assisted by Nishant Saxena to retrieve some of these pages from websites that archive content on the internet that have subsequently been removed or redacted. A look through these pages reveals a plethora of propaganda, all directed against the Congress, then led by Sonia Gandhi and the United Progressive Alliance (UPA) government headed by Manmohan Singh. Much of the content in these pages, including graphics, images and cartoons, is disinformation with a single purpose: to build Modi’s image as a mythical strong leader and trash his political opponents, notably those belonging to the Indian National Congress. Here are a few illustrative examples of headlines of articles from October 2013 that were put up on the website: “How Sonia Gandhi pumps up onion prices,” “Sonia Gandhi makes India worse than Africa” and “Impotent Congress.” In November that year, Anuj Gupta himself wrote an article for Mera Bharosa titled “Modi and Licence Raj: Licence to Liberty” raising expectations of new liberalised economic policies if Modi was elected to power. Gupta was then working with a consultancy outfit called Strategic Decisions Group with offices in Hong Kong and Mumbai that hired managers with Masters of Business Administration (MBA) degrees/diplomas from reputed educational institutions like the Indian Institutes of Management (IIMs) and engineers from the Indian Institutes of Technology (IITs). A person who had sought a job with Mera Bharosa said he had come across Gupta at the June 2013 launch in Mumbai of the website of a right-wing organisation called “Subhodini” which is a platform engaged in dissemination of information on Indian history and Indic culture. This person was later interviewed for the job by Gupta and Thukral. Prodyut Bora was of the view that “a semi-political activist (like Thukral) joining (what is supposed to be) a neutral platform raises serious concerns.” A member of the Congress, who spoke to us on condition of anonymity, said Thukral’s involvement in Modi’s pre-election campaign and subsequently, his frequent meetings with Hiren Joshi, made him wonder if Facebook would be truly unbiased during the election campaigns leading up to the 2019 election campaigns. Another IT industry professional, who too spoke off-the-record, had a different opinion and said Thukral had appeared to him to be politically non-aligned. “I guess he is just acting at the behest of his employer and his colleagues,” he speculated. Mera Bharosa was not the only web initiative of its kind before the 2014 elections. Others included Kamal Sandesh (Information from the Lotus – the BJP’s election symbol), Mere Sapon Ka Bharat (India of My Dreams), True Indian and Centre Right run by Prasanna Viswanathan, the current CEO of the right-wing website and magazine, Swarajya (meaning self-rule, a word/phrase used frequently during India’s anti-colonial movement). He pointed out that the BJP’s supporters were among the earliest adopters of social media. But they were fragmented across geographies, time zones and platforms. It was the Modi campaign that brought them all together in a centralized fashion. “The 150-odd trolls Modi met in July 2015 had been lurking on these platforms and seeding problematic information for the campaign well before the party came to power,” Sinha said. Before the 2014 elections, the BJP was Facebook’s only major political client in India. Ankhi Das worked closely with Joshi and made regular visits to Modi’s office in Gandhinagar. The relationship between Facebook and the Modi campaign grew deeper following his electoral victory in May 2014. Two days after the election results were announced, Das wrote a gushing op-ed article in Quartz India about Facebook’s role in Modi’s victory. The article can be accessed here. Earlier, in 2015, the Modi government rallied support for the social media platform by announcing an e-governance scheme called “Digital India” – all government departments, ministers and bureaucrats were asked to create Facebook pages to reach out to their friends and constituents. In effect, Facebook became the default communication platform for the government of India. In the years that followed, supporters of the BJP started “weaponizing” Facebook, Instagram and WhatsApp to target voices critical of Modi and his party. These three social media platforms together comprise the biggest advertising network of its kind in the history of humankind. But they have huge design issues that go beyond leaking user data. Facebook and its sister platforms are not just addictive but seek to convert politics into games. Democracy and interpersonal interactions turn into games of engagement: likes, shares, comments and a race to gather more followers. In India, representatives of various political parties have been reported saying that the chances of a person getting a party ticket to stand for elections would go up if the concerned person had a large number of followers on Facebook. In March this year, Prime Minister Modi asked his party MPs how many of them had over 300,000 “genuine likes” on their Facebook pages and said he would incentivise such MPs by appearing on video conferences for their supporters. Facebook, WhatsApp and Instagram, together also comprise the biggest consciousness manipulation infrastructure of its kind that has been constructed on a scale never seen before in the history of the world. In 2012, Facebook conducted a notorious global experiment to evaluate how changes to its news feeds affect the emotional state of its users. The results published in 2014 were not surprising. When users see more positive content on their feeds, they post positive content. And when people see negative posts, they post negative things. Simple, but true! Facebook makes lots and lots of money by manipulating the consciousness of its unsuspecting users. Extreme content generates extreme emotions and, therefore, enhances engagement. Advertisers realised this quite quickly. The tactics employed by political hackers are borrowed from the playbook of advertisers. Facebook does its part by providing support to political operatives to generate better, more effective and more polarising messaging. In the first article in this series of reports, we examined allegations relating to the alleged complicity of Facebook and WhatsApp in disseminating fake news, hate speech and incendiary information. In the second, we reported on how Facebook arrived at the dominant position it is in India at present with more than a little help from the current ruling regime. In this, the third report in the series, we outlined the role played by key individuals with close links with the BJP and Prime Minister Modi in propagating his party’s right-wing Hindu nationalist agenda on social media platforms like Facebook. The fourth article in the series will delineate some of the problems encountered by the opposition Congress party while engaging with Facebook. It also outlines and provides new information about the activities of Cambridge Analytica in India and delves into an allegation of possible conflict of interest concerning a senior employee of Facebook in India. The fifth and final article in the series records the social media platform’s often fuzzy responses to 64 pointed questions we raised.